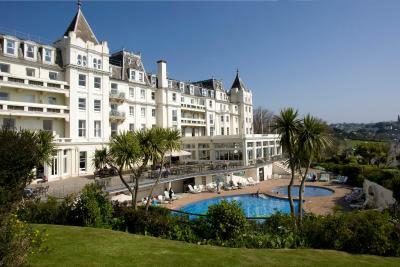 Lock in a great price for The Grand Hotel - rated 8.2 by recent guests. I thoroughly enjoyed my overnight stay at the Grand Hotel especially using all the facilities. Excellent locality, walking distance to Torquay town opposite sea. Parking was okay for me personally but might be a problem in height of season. Overall very enjoyable stay good 4 star hotel we had room 303 sea view with a balcony, lovely. Everything pretty much. Amazing room with views, it was a family room thou. More like a flat. Perfect. Spa and pool facilities were just amazing. Both pools clean and warm. Jacuzzi was good but with maybe to much chlorine!!! Sauna was good, a bit small mind you but very relaxing. Bar area is very grand with lovely staff to help what ever you need. Breakfast was very good. Service was spot on. Deffo thumbs up!!! Very happy from start to finish very friendly atmosphere and a quality breakfast well done the Grand will be returning. The Bed was comfortable. Rooms a little constrained as an older type property but had all the facilities needed. Staff were friendly and couldn't do enough for you. Breakfast was amazing! Even supplied gluten free bread. I took my boyfriend away for the weekend for his birthday and got supplied a free drink at the bar which was lovely. The location is brilliant, right in the middle of everything and the staff at reception were lovely. One of our top picks in Torquay.Attractively set in the centre of Torquay, The Grand Hotel features 4-star accommodation close to Riviera International Centre and Torre Abbey. This property provides a spa experience, with its hot tub, sauna and fitness centre. The rooms come with a TV with satellite channels. With a private bathroom equipped with a shower and a hair dryer, rooms at the hotel also boast free WiFi. The Grand Hotel offers a continental or buffet breakfast. There is an in-house restaurant, which serves a variety of British dishes. The accommodation offers an indoor pool. Torquay Magistrates Court is 0.7 miles from The Grand Hotel. The nearest airport is Exeter International Airport, 19.9 miles from the property. The Grand Hotel has been welcoming Booking.com guests since 8 Aug 2005. More spacious room with sea view. More spacious room with seaview. This room can accommodate 2 adults and 3 children. This room features an en suite bathroom and a TV with satellite channels, as well as a tea tray, hairdryer and room safe. With a sea view, this room features an en suite bathroom and a TV with satellite channels, as well as a tea tray, hairdryer and room safe. With a sea view, this one-bedroom suite is comfortably furnished. It is equipped with a remote control Freeview TV, a direct-dial telephone, hospitality tray, and a safe. The suite offers a lounge area, a bedroom, and an en suite bathroom with a hairdryer. With a sea view, this two-bedroom suite is comfortably furnished. It is equipped with a remote control Freeview TV, a direct-dial telephone, hospitality tray, and a safe. The suite offers a lounge area, 2 bedrooms, and a bathroom with a hairdryer. This room features an en suite bathroom and a TV with freeview channels, as well as a tea tray & a hairdryer. These rooms are slightly smaller than our standard rooms. Our owner, Keith Richardson, who bought his first hotel in the early 1990s, has a passion for the hotel business and this extends to every part of what we do...from the stunning period architecture, which is being lovingly restored and refurbished, to our individually-appointed bedrooms, our award-winning food and our excellent service. At Richardson Hotels, we are all a family too and we look forward to welcoming you and to ensuring your stay with us is one where memories are made. House rules The Grand Hotel takes special requests - add in the next step! Please note, this property cannot accommodate bookings of 5 or more rooms. The hotel was extremely warm, too much for me really but otherwise really superb. I don’t know how these guys are having 4* for a size of that room... window can be open just 25%, old mattress ( you can feel the springs ), no mini fridge ( again how do they have 4* without this? ), you don’t have the control of the temperature from your room ( they use a system for the entire hotel for heating and just between certain hours... ( again 4* hotel? ), one of the chambermaids dropped a glass with orange juice from room table into my luggage ( i hope the spots will go ), no iron and ironing board ( 4* ?... ), no locks on our door ( from inside ), old hotel. Location, heated outdoor swimming pool, comfy pillows, most of the staff was nice. We were located right next to a lift so a tad noisy at night. Need to add a minibar and air conditioning in the rooms. Also the breakfast can be of a better quality. Toothbrushes and toothpaste is expected in a 4 star hotel. Bit disappointed with the Sunday lunch. The asparagus and wild garlic soup was very thin , had a job eating it without spilling it off the spoon. Chicken leg and bit of breast with small hard greesy pots. Not worth the money.